Hello everyone! I hope you are all super excited for all of these new type of videos. 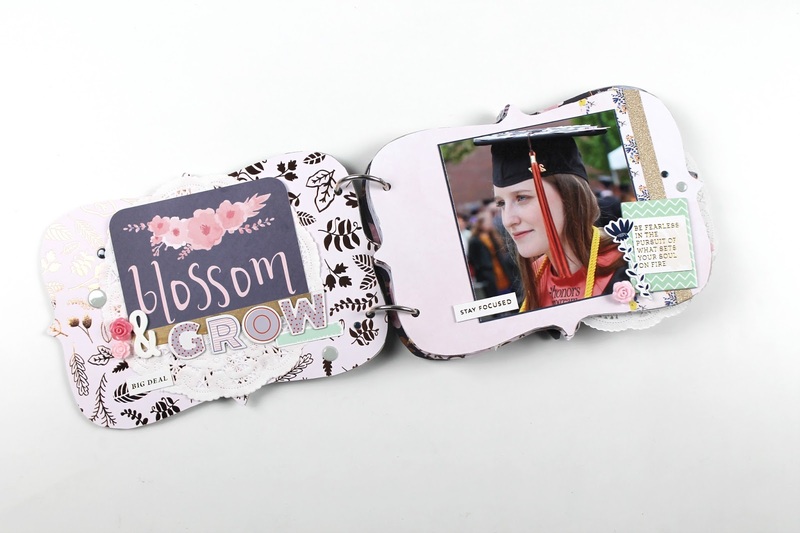 While chipboard albums may not be super popular any more, I think that they are still a great source of inspiration for other types of layouts and projects. Have you ever made a chipboard mini album? This album is to capture the memories of my graduation. Although there were so many memories, I wanted to create a special album for myself to catalog some of the most pivotal moments. Let's jump right in! I wanted the cover page to be very bold. The paper collection I decided to feature for this mini album is the Blue Blooms paper pad by Craft Smith Co. I love the detail that the navy flowers bring against the light baby blue background. My title is made out of a couple of different fonts. The word "following" is from American Crafts and the "my" is from Fancy Pants. The "dreams" sticker is a chipboard piece from the Maggie Holmes sticker set. I hope you enjoy the process video of these pages! This is the first mini album I have worked on in years. I really miss working on something that is full of textures that you can actually touch and feel. I tried to emphasize this throughout the album! The inside pages also featured papers from the Blue Blooms 12x12 paper pad. I mean, it is absolutely gorgeous! I'm so glad I got to use it throughout this project. The left page is a title page featuring a cut apart from the paper pad. I extended the title out by using some Paige Evans Thickers to spell "grow". I layered a white doily behind the cut apart and rounded the corners for a better fit. I also used some polka dot washi tape in the title cluster. To emphasize this page with more textures, I grabbed some resin flowers from my stash. Luckily, I have a bunch of different colors to choose from and these two matched perfectly. I finished decorating the page using a couple of stickers from the Pink Fresh Studio Indigo Hills planner icons set. I sprinkled some Fancy Pants puffy dots from the Golden Days collection. The other page features a photo of me getting ready for graduation. I matted the photo on some navy cardstock from DCWV. I kept this page quite simple. There's two strips of washi tape one from Pink Fresh Studio and the other from American Crafts. I used a chevron chipboard piece that said "dream big" as a layering piece under a Pinkfresh Studio quote sticker. Like the other page, this one is decorated with puffy dots and resin flowers. I am happy to share this album and the process of creating it with you all. I hope you enjoy this project and all of its installments. I think this album will serve well as a memento to look back upon this time in my life. Thanks for stopping by!